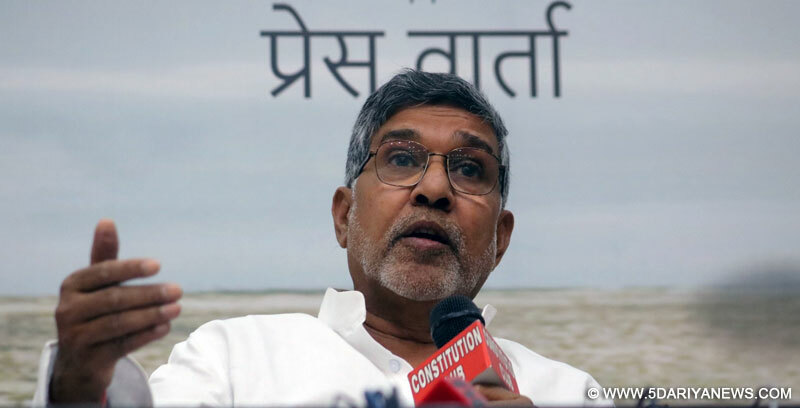 Nobel laureates and globally known leaders will meet here next month to discuss why children suffer the most in conflicts though they don't cause them, Nobel Peace Prize winner Kailash Satyarthi said on Thursday. "Children are never responsible for any wars, conflicts or violence, yet they are the worst sufferers in any such hideous situation," he said while announcing a global initiative for children. "This is completely unacceptable." Through the Kailash Satyarthi Children's Foundation, the Nobel Laureate is convening the first gathering of "(Nobel) Laureates and Leaders for Children Summit" that will see a global participation. The summit will be held on December 10 and 11 at Rashtrapati Bhavan here.About 25 Nobel Laureates and others have confirmed their participation in the summit which will also attract eminent personalities from academia, corporate sector, sports and civil society. The Dalai Lama, former Australian Prime Minister Julia Gillard, Ratan Kumar Nag (Grameen Bank), Yemeni rights activist Tawakkol Karman, Liberian peace activist Leymah Roberta Gbowee, South African humanitarian and Nelson Mandela's widow Graca Machel, Netherlands Princess Laurentien and American human rights activist Kerry Kennedy will take part in the December summit.Nobel Prize laureates Yuan Lee and Jose Ramos-Horta will also attend. "It is for the first time that such revered personalities will assemble together to give a clarion call for prioritising the issues of children in global political and social discourse," Satyarthi said. "No event of this stature has taken place before on Indian soil. "Satyarthi said that presently, "about 168 million children worldwide are serving in labour - almost 10 per cent of the world's population between the ages of 5 and 17. Around 5.5 million kids are in slavery". "More than half of these child labourers and around 85 million are involved in hazardous work. "Millions of children are continuously losing their childhood in conflict-prone environments," he said. "In Syria, an entire generation is being deprived of their rights. An approximate 5.6 million children are living in dire situations and face poverty, displacement and violence." Satyarthi asked why millions of children were deprived of childhood despite the institutions of governance, laws and conventions. "It is because of the serious moral deficit that results in social apathy and lack of political will for our children. "At the Laureates and Leaders Summit, we intend to build a strong moral platform for the protection of children worldwide. We need to ensure that every child is free, safe, healthy and educated," he added. "We will launch a '100 million for 100 million' campaign, which aims to mobilise 100 million youth and children for 100 million underprivileged children across the world to end violence against children over the next five years," Satyarthi said.